I've spent the last week packing up my apartment, preparing to travel for a continuous four months. And finally, my wife is able to join me! She's taking a four-month leave from her office . Luckily she is in architecture too but getting her to accompany me on 25-mile circuits of military bases is another matter.. So I have a strange love for packing up and moving out (my own stuff, that is). It's a pleasure to discover things like that favorite pen you thought you had lost, or to open an old sketchbook as you stuff it away. It's fun to try and erase your presence from a building. All the dust, the flour, the marks on the wall. Voices echo hollow inside the rooms lacking the stuff to absorb sound. Moving out means another opportunity to adapt to a new location, to build out a new space. For the next four months, that space will be a nomadic one. Driving down the 5 freeway to Los Angeles , I have finally found a way to entertain myself on what has to be one of the world's most monotonous drives. The Central Valley is actually a landscape of great diversity and interest. That is, if you are interested in power lines. Some of them have rat faces and some of them look like dejected puppy dogs. You can collect pet power lines: foxes. giraffes, rabbits, spiders, orangutans. The scale can get gargantuan. 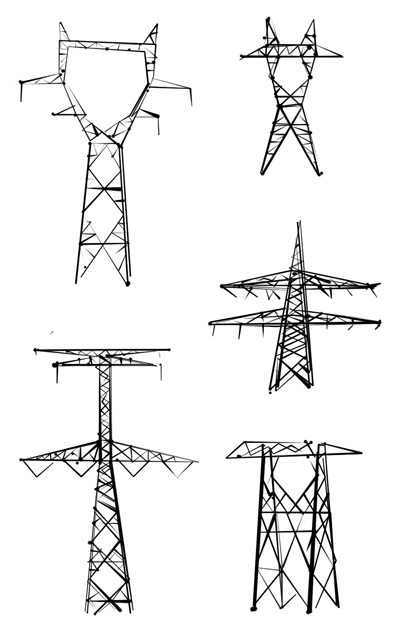 I would like to drive across the United States some day and make a typology of power line structures. They might become an endangered species in our lifetime. I suppose that wouldn't be such a bad thing. love it. as a child growing up in South Florida I always looked at the various power line supports as different types of characters (not animals per se). the somewhat menacing fellows -- with the pointy ears and squat torsos -- were always the villains in my young mind. some of the taller, thinner and more staid versions were protectors, offsetting the presence of the scarier characters. actually, a few days ago while driving from Jacksonville to Orlando I mentioned this fascination to my architect-girlfriend. for several years now we've discussed putting together a book on the Florida Turnpike, and decided just the other day that the power line characters would make a great chapter, or a tangent at least.